I have been meaning to tackle this subject for a while. I had my first taste of Korean fried chicken during my first week here in February 2004. Two Two Fried Chicken. I was instantly hooked.What makes Korean fried chicken so different? That’s not an easy question to answer. There’s not some monolithic Korean chicken recipe. There are many styles. I shall concentrate on the big three styles coming from the big three chicken chains, Two Two, BBQ, and Kyochon. Two Two style has the most Asian exotic flavor. There’s a little anise, black pepper, and cinnamon flavor to it. It’s similar to Chinese five spice but not exactly. On the Two Two web site, they say that they use traditional Korean medicine in the preparation. This follows a Sino-Korean approach to food and medicine. They are one and the same. In fact, that is a major selling point in a lot of Korean foods, even fried chicken. The health benefits are advertised on the same level or more than the actual flavors. Eun Jeong says that Koreans don’t like greasy foods. This is evident in the Two Two style of cooking the chicken. There is not much breading on the chicken pieces. They’re pre-fried and placed aside. It’s strange, but there’s a method to this madness. In restaurants I’ve worked in, we pre-fried the french fries. We called this blanching. We then put the fries aside for later. When we fried them again in hotter oil, the results were fries that were crispy on the outside with a mashed potato consistency inside. Yeah, yeah, you don’t get a mashed potato consistency in twice fried chicken. But you do get a crispier skin. Also, pre-frying lets the restaurant quickly prepare fresh chicken to order. Otherwise, you’d have a long wait for your chicken, or, like many American chains, you get chicken that has been sitting under a heat lamp, soaking in all its grease. Fried chicken at Two Two comes with a salt, pepper, and sesame seed mixture and a spicy sweet garlicky dipping sauce. You can ask for your chicken yang-nyeom 양념 style, where they smother the whole chicken in the sauce. I sometimes like this. Brant can’t stand it. He calls it “yang-yuck” chicken (“It’s too too sweet”). Most all the fried chicken establishments serve their chicken with the yang-nyeom sauce on the side or smothered all over. My only complaint with Korean fried chicken is the sides. If there were biscuits or a decent coleslaw, it would be perfect. Instead, we usually get a pack of pickled radish, which even Koreans I know say isn’t that good. We also tend to get shredded cabbage drizzled in lines of ketchup and mayonnaise. Some establishments mix the ketchup and mayonnaise first. That’s the closest we get to coleslaw. Barbecued chicken restaurants do this too, but that’s another post. We eat these sides because they’re all that’s available, and they help cleanse the palate when the mouth becomes too overwhelmed. That’s the Two Two style. It’s safe for me to claim that most chicken hofs use this style. And that’s another good thing about chicken hofs. They’re hofs. You can have beer with your chicken. 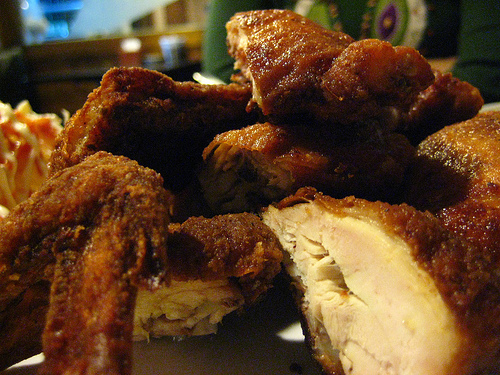 In fact, yes, fried chicken is considered a drinking food–well, at least a party food. It’s not dinner. It’s something you eat after dinner or at a birthday party. You can even order draft beer to go. There are Two-Two chains in Japan, Russia, Vietnam, and Australia. There don’t seem to be any in North America yet. Now for the other styles. BBQ (pronounced Bee-Bee-Cue) is the largest fried chicken chain in Korea. They have a thicker breading on their chicken and don’t use the twice frying method. It’s closer in style to American fried chicken. Yet the spices they use are different. I can’t put my finger on it. They brag on their web site that they use a lot of ’em. BBQ also follows the trend of advertising its health benefits. When I first came to Korea, it was plugging its Calcium Fried Chicken. I don’t know still how they put the calcium in the fried chicken. Do they soak it in milk? Now they advertise that they fry their chicken in 100% olive oil. They have big cans of olive oil sitting outside their stores. Nonetheless, they put out some really good chicken. The flavor is addictive. If they ever set foot on American soil, they would expand as quickly as Krispy Kreme has expanded in Korea (there’s now a Krispy Kreme within walking distance to me… my poor waistline). So far, they have expanded into China and Spain. This past summer, BBQ came out with what they called an African chicken. It’s a barbecued chicken that tastes very close to Jamaican jerk chicken. Another hit from those guys. BBQ is not usually a chicken and beer place. Yet they have recently started opening “BBQ Chicken & Beer” hofs. I’d like to check that out sometime. The third main style is Kyochon. Kyochon boasts that its chicken stays crispier longer. Their method is to dip their chicken in a sweet garlicky batter before frying. They also don’t pre-fry, and each time I’ve gone to Kyochon, it has been a long wait to get my order. They are also the greasiest of the three styles. Nonetheless, they are good. I know some people who swear by Kyochon chicken. And the people I have introduced this to have been surprised by the flavor. It’s one of those chickens that causes, hmm, less than refined behavior in people–sucking on chicken parts, licking fingers, making Cro-magnon grunts. Kyochon also promotes itself as “better-being.” I don’t know specifically what its health benefits are, but they do have a new walnut fried chicken that I haven’t tried yet. I think they’ve also resolved to stop using trans fats. All Korean fried chicken places cut their chicken in the Asian style. Rather than cut them based on the joints between bones, they hack them with cleavers or scissors into mysterious pieces. This makes the dark meat almost indistinguishable from the white meat. One thing I like about many of these chicken places is that these are great mom and pop operations. Last week, I got some chicken from a place close by that I hadn’t tried yet. They were a Two Two style hof. It was a wife, a husband, and two children in hapkido uniforms. The husband was very chatty and asked me lots of questions in Korean and English. He made me feel like they were cooking me a home cooked meal. One of my first Korean friends outside of my workplace was the guy who owned the BBQ near my place. He always greeted me when I passed by and sometimes gave me discounts on the food. One evening, I got stood up on a date, and took the long subway ride back home. I walked forlornly through my neighborhood to my apartment. The BBQ guy saw me pass and noticed I didn’t look like my usual happy self. He opened his cooler, tossed me a canned soda, and patted me on the back. That, my friends, is Korean hospitality. Update: Kyochon has opened its first store in New York. KFC in Korea has biscuits, but they’re getting smaller, drier, and a bit rubbery. I now make my own, since I have an oven. They do have a killer corn salad. Thanks for the Fatman Seoul link. I shoulda checked there first. I’ve only had a chance to try Two Fried, but I’ll be sure to check out the other KFC as well. Thanks for the report. What kind of sides do they serve at KFC (the Colnel KFC)? Fatman Seoul had a story on BBQ from 2004.. you were pretty close, they marinate the chicken in milk calcium. Excellent post, Joe. Glad you put those pictures to good use. I love TwoTwo and I will swear by their chicken. There is a BBQ by my place but I’ve yet to try it. I can’t wait! Knowing my luck, Immigration will be giving me a call about doing activities “separate” from my visa. I know, and I was joking too. 진짜? 교촌 잠바라야 소스 있어요? Sounds crazy but sounds good. Ah, your blog would be expected to “explode”!. Today, Korean major portal sites cited your blog and NYT articles on Korean style fried chicken. You may be appointed as a chicken ambassader!! I apologize to sounds like that. I like to make it clear that I didn’t think you of a free coupon seeker or amateur gourmet. As I mentioned, in the point of view as a Korean and chicken mania, your categorization is impeccable. yes! walnut fried chicken is served with the sauce. Enjoy it! 예 ‘호두후라이드 치킨’시키면 같이 준답니다 즐감! ^^. I am personally an addict to the Kyochon hot…that is some tasty chicken! I usually have it at home with rice and a salad (my wife thinks I am crazy). I think all of them would work pretty well. Kyochon, which according to the NYT article seems to be the prevalent style there, may reheat well. Personally, like Alton Brown, I’m a fan of cold fried chicken too. Which brand/ style / recipe would you recommend for takeout, with re-heating an hour or two later? Donky Chicken < -- yep, that's how they spell it), is everywhere. I haven't eaten at one yet, but I used to pass by one every day and could smell it. My guess is that they're Two-Two style. Just stumbled across this post! Last time I was in Pusan (summer ’93ish), we picked up a lot of “Donkey Chicken” (I kid you not, it was a local restaurant that served chicken in yellow take-out boxes, I think?). Anyway, is that a big chain, and would you happen to know what style it was? It’s a long shot but my husband doesn’t believe that the place exists (or at least with that name!). Love the site – very inspiring and hunger-inducing! A very impressive info for chicken lovers, thanks. By the way, has anyone heard about BonChon Chicken? I know there already are a few open in tri-state area. I am wondering how it compares to the other big three you mentioned. hello. i would like to try and cook kyochon-style/tasting chicken for my party. i wonder if you guys know how to cook it (recipe) or at least something close to it. Thanks a bunch! The actual technique I still don’t know. My guess with Kyochon style would be to make a batter with flour, a little baking powder, garlic powder, a little sugar, black pepper, and the liquid of your choice (my choice would be beer). I am in South Africa and want to know about franchise opportunities? THEY OPENED A KYOCHON IN TORRANCE, CA! SO GOOD BUT PRICEY!! I am in Malaysia and want to know about franchise opportunities? There should be more of these franchises in America. This beats American hot wings in my opinion. Two thumbs up! I’ve seen one restaurant make it on TV. There aren’t recipes floating around in cookbooks, like there aren’t KFC recipes on American index cards. But it’s on my agenda to use a weekend to figure out the recipe and technique. Fantastic discussion , I was fascinated by the facts ! Does someone know where my assistant could possibly acquire a PDF copy of this recipe?